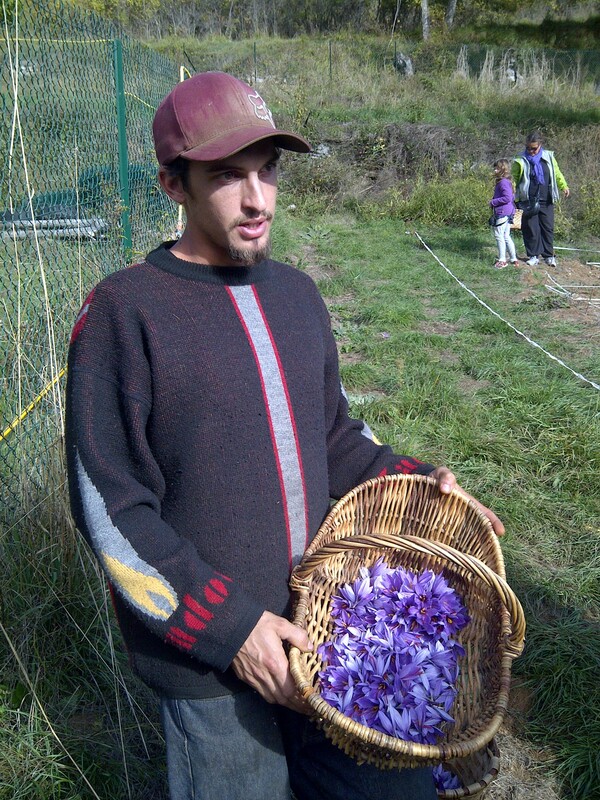 Today local saffron producer Christophe Marro, at his alpine farm, Le Cabane Safran, below the village of Venanson, opened his doors, well gate, to the public to help with the harvest of their saffron and to introduce people to the different ways of using saffron. 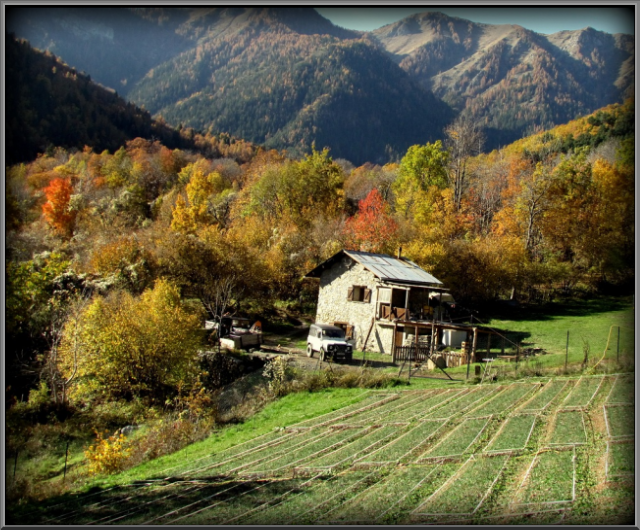 Their southerly exposed field, lies sheltered in a half basin between the mountains at 1000m. The most expensive spice in the world comes from the purple saffron crocus which needs to be cultivated in well drained soil and which can tolerate frosts and temperatures to -10C. The saffron crocus is unknown in the wild; its most likely ancestor is the Crocus cartwrightianus which originated in Crete or Central Asia. The crocus and the saffron stamens featured in Minoan art and culture. The saffron crocus is native to Southwest Asia and was first cultivated in what is now Greece. 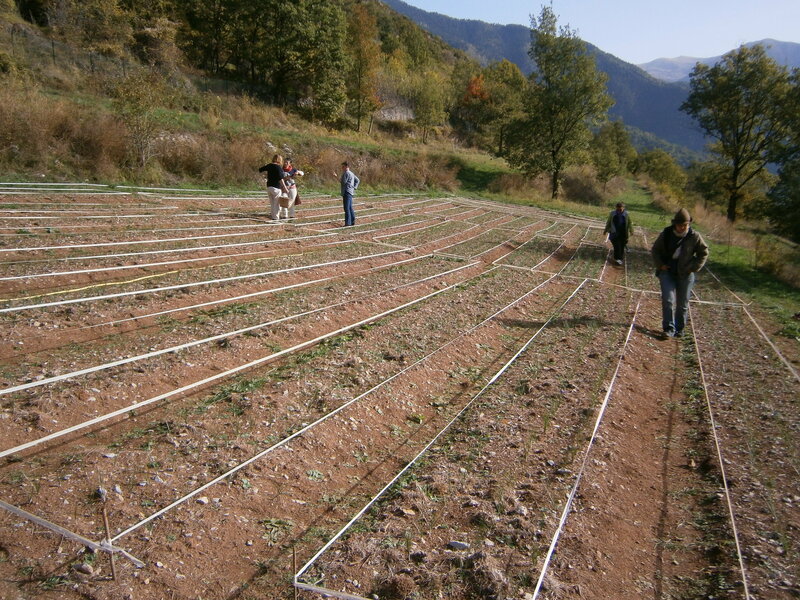 Marro planted 4000 saffron bulbs in early 2010 and, with Mélanie Cassard, runs his organicsaffron farm as well as growing apples, quinces, pears and plums and also makes jams. Melanie also works at the restaurant O a la Bouche at le Boreon and saffron themed meals are held during the autumn saffron season. Saffron is a traditional ingredient in the Provençal fish stew Bouillabaise. According to the Michelin Guide Vert, the four essential elements of a true bouillabaisse are the presence of rascasse, the freshness of the fish; olive oil, and an excellent saffron.